I recently stayed at the Inn at Lynden while visiting the little town of Lynden, Washington known for its Dutch heritage. The town experienced an influx of Dutch immigration in the early and mid-1900s. 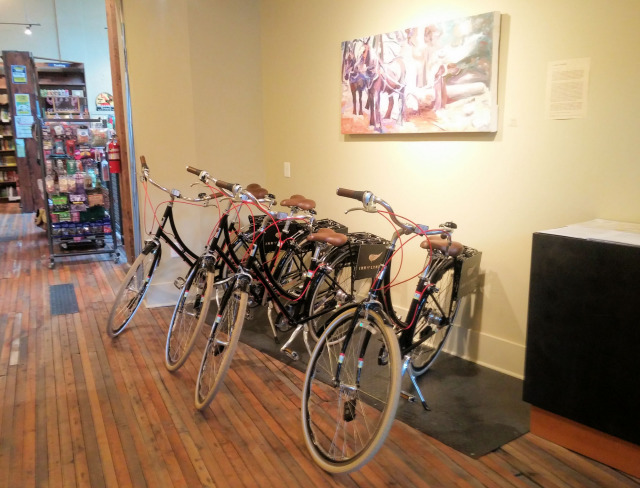 History is full of tales, and in the Dutch-themed town of Lynden, Washington, the Waples Mercantile Building has become a caretaker of one of these tales. 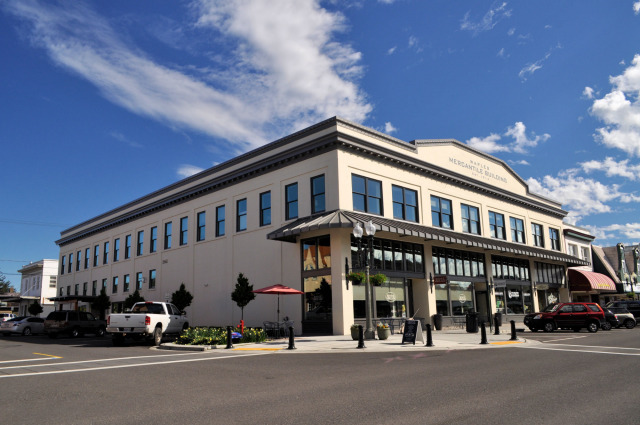 Originally called the Lynden Department Store, the building was built in 1914 by Billy Waples. Since 1897 he’d operated a general store, which kept growing and eventually became one of the most successful department stores in the Northwest. 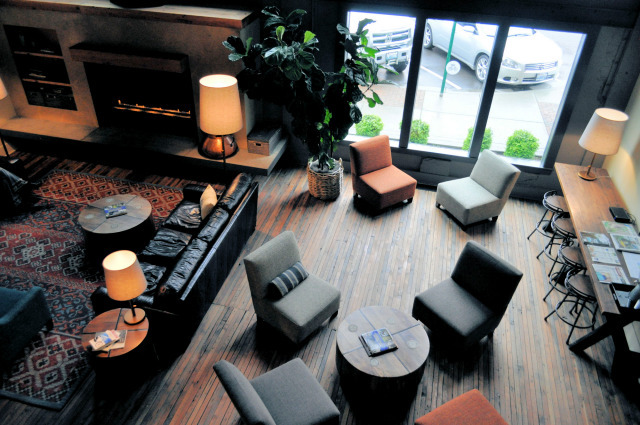 In 2015, this iconic landmark debuted a reimagined life as a multi-use building that includes restaurants, shops, a tap room and the boutique lodging The Inn at Lyden. 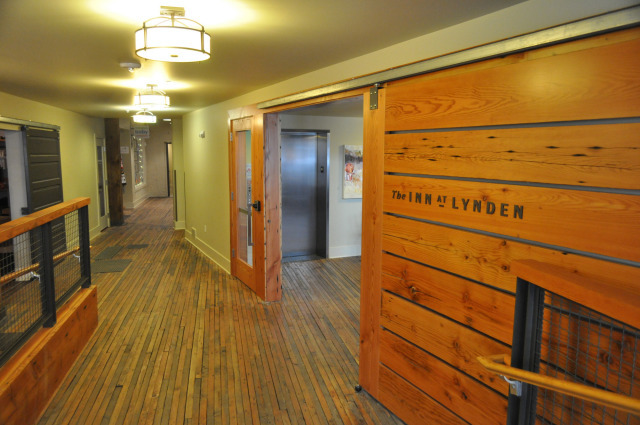 As a guest of the Inn at Lynden, I discovered comfort, style, and history in the heart of downtown Lynden. From the moment I stepped inside, the building’s distinctive touches stood out, like the original 2 x 6 fir flooring and the massive wooden sliding door that I later learned was part of a large roof beam. In the lobby, heavy timber columns stretched all the way to the ceiling, and both the columns and the fir flooring continued throughout the entire ground level to its neighboring businesses Village Books and Paper Dreams, Avenue Bread, Drizzle Tasting Room and Restaurant, Overflow Taps, and Bellingham Baby Company. The style, with warm wood tones, high ceilings, and large windows continued through the ground level, making it almost a seamless transition from one shop to the next. Before checking-in I took a few moments to admire the lobby’s open layout which had plenty of seating and soothing earthy tones, a fireplace to warm up on a chilly day, large paintings, and natural lighting. Next to the check-in desk, I noticed a row of Dutch-style bicycles and decided I’d have to take one for a spin. 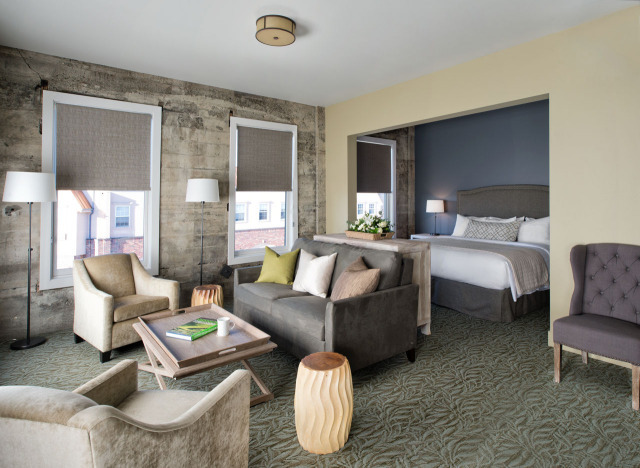 I was delighted with the decor of my Deluxe Corner Suite, which had a mix of eclectic furnishings, plush comforters, soothing colors, and creative historical touches like exposed concrete walls and a photo of the building in the throes of construction. The suite also included a huge bathroom, a wet bar with a refrigerator and microwave, a flat screen television, a dining table, a sitting area with a sleeper sofa, reading chairs, and a plush king bed. One of the amenities I really enjoyed was the suite’s eight windows, which allowed for plenty of natural light and unobstructed views of downtown. 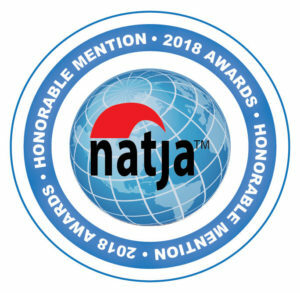 For more information, visit the Inn at Lynden, and Bellingham Whatcom County Tourism. There are plenty of ways to get the local scoop. See the Inn and read reviews on TripAdvisor. Love the floors and the high ceilings. Fancy! That seating area in your room is fantastic! Melody, The corner suite was super nice. Loved the view and the decor! They really did a great job. You’d love it!